No budget for custom graphics — yet you need a map for your website or presentation, to help show your membership reach or the areas in which your organization does its work? No problem. Wild Apricot now includes a members location mapping tool. This gadget pinpoints your members' locations on a map, and automatically updates if their details do. You can choose which members are shown and which of their details are included, and you can add this gadget to any page on your site, including members-only pages. Find out more by clicking here. However, if you're looking for a static map (to include in a presentation, for example), the internet offers a variety of free map graphics, many of which you can customize as needed. 1. Vectorportal’s free maps are mostly in EPS format, for editing with a vector-based graphics program such as Adobe ILlustrator or CorelDraw. These maps were created and submitted by a number of different artists, so the quality does vary as well as the style — but with more than 150 maps to choose from here, you’re likely to find something you can use. All of these files are covered by the Creative Commons Attribution License, which means you can use them for all kind of projects as long as you give credit back to Vectorportal.com. 2. Free blank US state outline maps are available in both Illustrator & editable PDF vector formats. If you want a map of the whole United States, you’ll have to put the states together yourself like a jigsaw puzzle — but these are clean, simple, digital images that should be useful to many state-based organizations. 3. 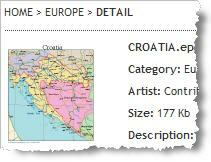 Free Sample Maps from MapsForDesign.com are royalty-free maps in editable EPS or PPT formats. The maps are high quality, but only a limited number are made available as free samples: Israel/Middle East, Taiwan, portions of the USA and a few individual states, one Canadian province, a Mercator projection of South America, etc., so you may or may not find the map you need. 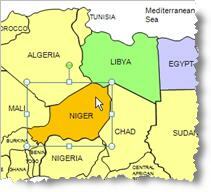 But if you’re looking for a very good customizable map of Africa, do check out this site first -- it's the best free version I've found yet. As a bonus, Map for Design’s related “how to” blog offers some excellent video tutorials for those new to editing PPT graphics. 4. Free editable Powerpoint vector maps from PresentationHelper.co.uk are part of a real treasure trove of free PowerPoint templates to suit every occasion. The maps and templates are “free for commercial and private use, but not for re-sale or re-distribution.” Currently available are a fairly rudimentary world map, and more detailed maps of North America (including Central America) and the UK and Europe. … If you’d like to use a font of mine for commercial purposes, I ask that you make a donation to the Intrepid Fallen Heroes Fund. After making your donation you have the nonexclusive right to use the font for unlimited commercial purposes and in any medium (print, online, commercial, merchandise, logos, etc.) EXCEPT redistribution of the digital font itself in any form. Tip: The font repository website Dafont.com has some good clear instructions for how to install a font if you need a bit of guidance. 6. 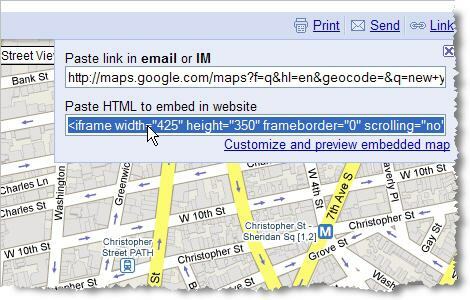 To take a slighthly different approach, you might want to embed a detailed interactive map from Google Maps on your web page. Simply search for the map location you are interested in, zooming in right down to street level if you like, and click 'Link' in the upper right corner to get the copy-and-paste HTML code. Some limited customization of the maps is possible, and you can also choose to grab a link to send by text or email. What other online resources for free map graphics can you suggest? Using a googledocs spreadsheet you can show multiple locations on a googlemap using City / Zip / Postcode. Ideal for membership organisations to plot member's location and other data. Mark, that's a cool tool - thanks very much for sharing the link! http://mapalist.com/ is just about the best free mapping site out there - love it.